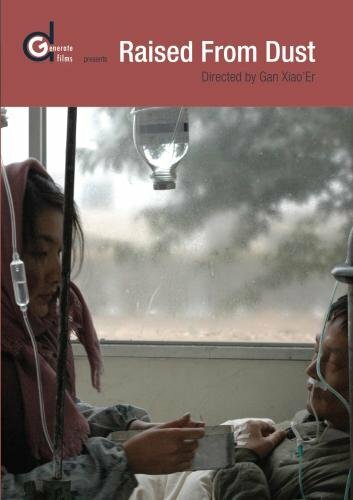 RAISED FROM DUST, by acclaimed independent Chinese filmmaker Gan Xiao'Er, presents an unprecedented, intimate portrait of the lives of Chinese Christians in rural China. Xiao-Li (Hu Shuli) is a devoted housewife and an active member of her local Catholic church in the Hunan farmlands of southern China. Her faith is put to the test as her husband (Zhang Xianmin) is hospitalized with respiratory illness due to unsafe working conditions, leaving his life clinging to an oxygen machine. Forced to work simple jobs to pay for her husband's hospital care, Xiao-Li takes her young daughter (Lu Shengyue) out of school, unable to pay for tuition. She finds support from members of her church, and loses herself in making preparations for a church wedding ceremony. The church itself is watched with suspicion and ignorance by the community at large, who approach it only when looking for a superstitious cure for someone's illness. Their superficial understanding of faith contrasts with Xiao-li, who is ultimately called upon to make a life-or-death sacrifice to save the future of her family. A heartbreaking story told with compassion while avoiding melodramatic excess, RAISED FROM DUST sheds light on the unexplored lives of the approximately 40 million Christians in China. Filmed with a beautiful eye for both vast rural landscapes and human intimacy, RAISED FROM DUST announces Gan Xiao'Er as a new major talent possessing both unique stories and genuine storytelling abilities. If you have any questions about this product by dGenerate Films, contact us by completing and submitting the form below. If you are looking for a specif part number, please include it with your message.